Paddy called me twice yesterday afternoon, while i was in the midst of fire-fighting and talking to the first of a line of pp waiting for me, office phone ringing with outside line, and boss intercomming me, and Paddy came on my handphone. I had to prioritise and ignored the handphone. But but but i called him back as soon as i could, 20min or so later. more than 2 weeks, so long that it wasnt funny anymore and we were all desperate and suffering from withdrawal symtoms. now that it is UP, my company's internet went down the Cisco firewall quit on us. Seriously, it must have been eons when exchange hit that kind of figure where US$20k = S$56,600 (2.83), or maybe since never. 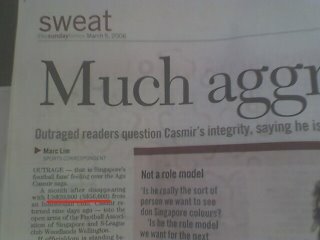 Agu was fined S$20k for bringing the game into disrepute, and had to pay back U$20k to the Indonesian club he scammed. That may add up to US$56,600 if you use 1.83 exchange rate. So which is it, ST cant do Math or sloppy reporting? i say both. Had to rush down to ICA on Monday to make a new passport. I had less than 6 months to the expiry of my current passport and couldnt travel on it, and i have TWO trips next week! Could have sent in the application online or by post, but I didnt have time to take a digital pic and photoshop it according to the specs, and no instant photo shop was willing to take a passport sized photo for me for passport application purposes. Me: "Hi, i'd like to take instand passport size photo please"
Girl: "ok, for what ah?" Me: "huh? for making PASSPORT"
Girl: "oh, like dat ah, then we dont do"
Girl: " yeah, nowadays they quite strict, the photo we take maybe cannot pass. we receive a lot of complaints, so nowasays we dont do"
Girl: "you go take at ICA lah, take there one confirm pass"
and that was how i ended up standing in a photo queue for 1.5 hrs today, clashing with families with kids in tow, taking photo for passport to go on holiday, disgruntled parents with failed photos, near a lift lobby with little ventilation, and bad b.o. all round. When i got to the front of the queue, i saw why it took so long. Every photo had to be resized from chin to forehead, cropped, brightness adjusted, color adjusted, all glares/ reflections from oily forehead/ chin/ cheek/glasses/ face taken out, even the backlight reflected on the chin line. (i guess if you paid them more, they would have erased wrinkles, large pores and pimples too)And only after the photo was printed was the next person in line allowed into the booth, and only after they switched stools/ chair/ highchair depending on the size of the subject. Add to that wailing kids who cry at the sight of camera (roll eyes), cant sit still, dunno where to look, and babes in arm (darn cute but lots of work, the lady even photoshopped away the crease line on the cheek of a baby who fell asleep against her mom's sleeve's joint). in the end, i dropped the application into the deposit boxes in ICA instead of submitting at the counter, which would have cost me s$10 more, and worst still, at least another hour. good grief. Ok. i'm shallow. i was prompted to read the book after Oprah touted it on 1 of her shows, and that one of her celeb friends claimed that it changed her life. so i seeked it out, and took almost 2 months, snatching moments while waiting/ riding the train, taxi or down time (what down time?). and i finished it recently. and i was like, "huh? that's it? what does it mean? what was the point? was there a moral of the story? what did i learn?" in the end, i realised i was cheated. it was probably a revolution when it was first published in the 1960s in Mexico. a story about the birth, life and death of a whole clan of family, together with their incests, beastiality, magic, curiosity, people with the same names over the various generation and suffering the same strange afflictions of withdrawal, violence and selfishness. Men and women who grew to over 100 years old, virgin who ascended to heavens, jealously, war, politics, adventure, love and curses. Lots of things going on, and with the tales interwoven and told in a non-literal time line in a tangled mass where some people's fates where told in the beginning, and the beginning was in the middle. Made worst with pp from the different generation sharing the exact same name or nick name, (there were no less than 20 Aurelianos and and 8 Arcadios, not to mention the girls) no wonder there was a family tree in the front cover of the book. And at THE END, you realise that the book you are reading was supposedly the book that the last of the line was translating as death befell him as foretold in the book he was holding. made worst by my having persevered and finished it. other readers say that this book continues from where Genisis left off and a history of from then till now blah blah blah. Dana Reeve, the widow of Christopher Reeve aka Superman, passed away on 7-March-06 from Lung Cancer at 44. She was a non-smoker. She left behind a son, and 2 step children from Christopher's 1st marriage. Christopher Reeve passed away in Nov 04. They have fought the good fight, never giving up, loving and caring for each other till the end. ok, ok, i know it is 3 months since SCSM. but but but what i do? 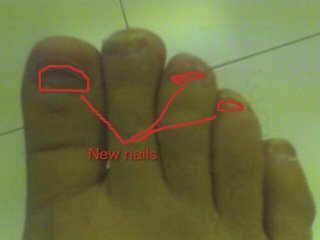 the nails drop off 1 by 1 what! but i'll still be checking in, say 2-3 times a day just in case it is UP, ok? Oh gosh~*! Jeff Yen says thatSPUG is down! the server has crashed and will only be restored over the weekend! SPUG, get well soon, and you, the angel restoring the site, THANK YOU SO MUCH. i'm busy, very busy, extremely busy, overwhelmingly busy. so busy that i eat my lunch in, drink too little water, take too little toilet breaks. so busy that i'm curt over the phone, and quick to cut pp off when it is obvious that they are wasting my time in selling me a service i dont need, dont know who they are supposed to be talking to, dont introduce their company or themselves properly. at least i still say "sorry, you caught me at a bad time, call me another day, like a month from now", "sorry, no thanks". but i know one of these days i'll starting cutting pp off by hanging up unceremoniously, or maybe i'll start screaming first. in fact, i'm so busy i could cry. the number of overdued tasks in Red and the ceaseless reminders on BOTH my pc and my treo ( now that i've started to synchronise my outlook with with my treo) chimes every so often that i'm beginning to hit the snooze button without seeing what was the reminder for. and i'm starting to put in every single minute task that i'm to do, in case i forget, and for the satisfaction for checking it off when it is done, no matter how simple it was. my back hurts, my shoulders are frozen, my eyes are bleary, i munch on too much junk/ spicy/ sour food, my headache is killing me. i really am gonna cry. 22 days more to go before i can hand over the extra workload. i only wish that i'll have the grace to do it without laughing out loud.